An impressive second half display from Peterhead after an even first period saw them run out comfortable 3-0 winners over Clyde on Saturday. Danny Lennon’s side arrived at Balmoor as League 2’s in-form side with 10 wins from their previous 13 games. But they were behind early as the league leaders made the perfect start by taking the lead in the fourth minute. A Willie Gibson corner broke to Jack Leitch and although his 12-yard shot was blocked near the post, Russell McLean pounced to fire home from point blank range. The Clyde response was a David Goodwillie shot from the edge of the area as he tried to add to his 25 goals, but his low effort was smothered by home keeper Greg Fleming. On the quarter hour a Jordan Stewart free-kick 22 yards out looked to be heading well over but dipped at the last moment forcing Fleming to tip the ball over for a corner. Three minutes later a Kieran Duffie cross from the right wasn’t cleared by Jamie Stevenson and the Blue Toon defence were lucky when Barry Cuddihy’s shot was deflected into the arms of Fleming. Peterhead started the second half in positive mood and a Jamie Stevenson effort from 25 yards that wasn’t far away seven minutes after the restart showed their intent. 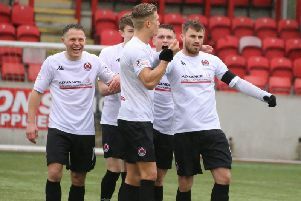 Mark Lamont turned and shot narrowly wide for Clyde then at the other end an Alan Smith shot was blocked for a corner from which Jason Brown’s header was stopped on the line by Chris McStay. Just after the hour mark a Gibson free-kick from the left side of the penalty area became a shot rather than the expected cross and visitors’ keeper Kyle Gourlay did well to hold the fierce effort. But Peterhead doubled their lead in the 68th minute when Stewart bowled over Stevenson on the right side of the area with an overly robust challenge with his shoulder and McLean netted his second goal with an immaculately taken penalty. The third followed in the 79th minute, a shot 12 yards out by substitute Rory McAllister taking a deflection off Lamont on its way in. Boss Lennon admitted: “I thought the hungrier team deserved the points today and we didn’t play our game. “In hindsight maybe we could have freshened things up a bit but we have been playing well and winning recently and you have a bunch of guys that have done fantastically well but it just didn’t happen for us today. I thought Peterhead were sharper on the first and second balls all game.